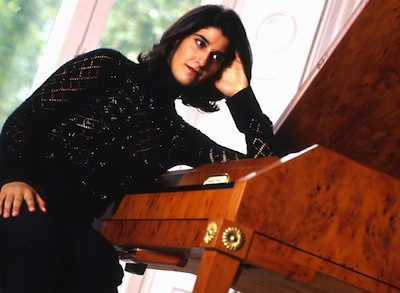 Sharona Joshua began her recital at the Mansion at Strathmore Thursday night with Beethoven’s piano sonata Op. 31, no. 3, the “Hunt” sonata, and it soon proved that Joshua was unequal to capturing her quarry. Frequent spasms of missed notes marred the performance, and transitions between musical paragraphs foundered on awkward, momentum-draining pauses, like a car encountering a pothole; at one point, she even paused to reach up and push her hair back from her forehead, mid-phrase. It was not hard to infer that Joshua was actually having trouble remembering the notes in the sonata; this was confirmed when she pulled out the score after the second movement and set it on the piano, and even then, she could barely string the melodies together. After the first of these interstitial interjections, she went backstage, and returned with a young woman in tow to turn her pages. She spent the rest of the recital on a musical journey that, at isolated points, touched the heights of mediocrity. The importance of this journey did not deter Joshua from giving her page-turner glares and at least one hand-swat when an apparent disagreement occurred, and at one point Joshua opened up the floor for questions in the middle of her recital, which is not cool on a work night. Q&As come after the concert, when people can easily leave! Joshua has an international career as a harpsichordist and fortepianist (she played Strathmore’s 1850s Broadwood piano on Thursday), and so she clearly has had a lot of performances that went much better than this one did. (Listen here for examples of Joshua on her game.) I suspect that this was just a one-time thing and that future performances will show a more confident, assured artist. Unfortunately, what us Strathmore patrons got from Joshua was some of the worst piano playing I’ve ever heard. 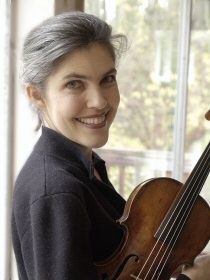 A couple years ago, the Bach Sinfonia moved its concerts from Woodside United Methodist Church to the new Morris and Gwendolyn Cafritz Foundation Arts Center at Montgomery College’s Takoma Park/Silver Spring campus. In doing so, they lost a bit in acoustics (I still remember fondly the golden glow WUMC cast on all music made therein) but gained padding on the seats, ample parking and restrooms, and better climate control — overall, a good trade. Vivaldi actually presented these concerti as a multimedia experience, if we count music and text as separate media, since someone (perhaps Vivaldi) wrote sonnets designed to concretize the seasonal scenarios depicted in these first four concerti from Big Tony’s Opus 12. There’s even a system by which the lines of the sonnets are tied to lines of music. So one obvious thing to do onscreen was to show the words. In a pre-concert discussion, though, Abraham indicated that talking with his American University colleague Sakellion suggested the idea of creating a response to the music. She brought in Da, and the idea grew. All this sounds fearsomely complicated, but it was designed to be in the background; indeed, it would have been hard to take too much attention away from Matthews’ “Four Seasons.” She produced a superlatively clear, clean tone on Saturday, the type that makes even the most passive listener perk up and take notice, and she directed the Sinfonia in performances as vigorous and stylish as we have come to expect from their efforts under Abraham. Though her solos lacked the extroverted dazzle that I always think Vivaldi must have commanded, they showed a searching temperament married to keen instincts for melodic ornamentation, resulting in moments of genuine spontaneity in music with which we are all superlatively familiar. Unfortunately, a few moments in spontaneous rhythm drew Matthews out of sync with the rock-solid rhythm section, anchored on Saturday by baroque guitarist William Simms, cellist Douglas Poplin, and violone player Robbie Link. She also could have varied her tone more, perhaps roughing up the rustic imagery in the “Autumn” concerto, or making her sound more sere in the scorching “Summer.” But these are minor points in comparison with her major successes: When she scaled back her volume to mingle with the Sinfonia’s violins in birdsong during “Spring,” the music seemed to be floating in midair, and her soliloquy towards the end of “Autumn”‘s first movement similarly seemed to suspend time, while her “Winter” sound was as icy as anyone could want. My major quibble with the screen’s contribution to the performance experience, ironic considering the genesis of the project, was that the assembling and dissolving of the text took my eyes off Matthews and the band for what seemed like inhumanly long periods of time, though it must have been mere seconds. It also make the resulting words harder to read (was that an “i” or an “l”?). The background coloring (green for spring, red for summer, etc.) set moods nicely, and the images similarly evoked the sonnets, though I got tired of seeing that one guy all “Autumn.” The real-time processing produced some entrancing effects, especially in “Spring” with the leaves tracing lacy arcs across the screen, and some boring ones, like when it was all too obvious that Max/MSP was listening almost solely to pitch and Da wasn’t interfering. The total effect would have been more vivid if the stage lights hadn’t washed everything out a bit. Still, when the big screen came down, no one in the audience, or even behind the MacBook screens from which Abraham, Sakellion, and Da controlled it all, knew exactly what was going to happen. When Matthews had space to explore her music, even having heard these concerti so many times, it was hard to predict what would come next. And so 18th-century and 21st-century spontaneity came together on Saturday. It wasn’t always successful, but given the artists involved, I’d certainly go back to see them try it again. Other People’s Pespectives: Charles T. Downey. The violinists at Saturday’s performance were all veterans of many Sinfonia efforts. I started yammering to my concertgoing companion about their various strengths when I realized I was using their first names, like I knew them or something. It seemed weird. Also, I encourage you to poke around Yan Da‘s site, which I have helpfully linked to again down here. That guy does a lot of interesting stuff, most of which I do not understand at first glance. But it looks worth exploring. You are currently browsing the DMV Classical weblog archives for May 2011.